It seems that a month can't go by without a new Vinny to Montreal rumour. The summer has slowed down, so why not? It's the easiest rumour/story to write. Hockeybuzz is saying, once again, that Montreal is preparing themselves to "sell the farm" to get Vinny either at the trade deadline or before next summer's draft. Supposedly Vinny is "absolutely willing and would love to be a Hab." If that is the case, why didn't he jump ship a couple of years ago? Perhaps... no pressure, no state income tax, great weather, playing with Richie...need I go on? He's got 2 years left on his deal, and you can expect Feaster to get an extension done around January. If he isn't able to, then this story/rumour may have some legs, but until then it is just a bunch of hot air blowing down from Canada. Besides who do the Habs have that they could offer up for Vinny? Price? A rookie goalie with a lot of potential, but not enough for Vinny. I just don't see it happening. Obtenir une vie vous canadiens français! TAMPA BAY – The Tampa Bay Lightning have re-signed defenseman Doug Janik to a one-year, two-way contract, Executive Vice President & General Manager Jay Feaster announced. Janik, a 6-foot-1, 209-pound native of Agawam, Massachusetts, played his first full NHL season with Tampa Bay in 2006-07 after earning a roster spot during training camp. He finished the season with two goals and 11 points in 75 games. Janik averaged 14:28 of ice time per game last season and ranked fourth among Lightning defensemen in blocked shots with 98. He scored his first NHL goal on January 2 at Montreal and recorded his first point on November 22 at Florida. Janik also played in one Stanley Cup Playoff game. He is a veteran of 85 regular season games and six playoff games with the Lightning and the Buffalo Sabres. "We have been trying to sign Doug Janik since our season ended prematurely in late April; however, the issue was and has always been that we were not prepared to offer him a one-way contract,” Feaster said. “While we obviously lost a pair of defensemen this summer, the fact remained that when we acquired Shane O'Brien at the trade deadline last year Doug became the odd-man out of the lineup. We have every confidence that Doug can and will compete hard in camp to win a job on our blue line, but we felt the need to protect our downside in the event one of our other players jumped over him and grabbed the final spot. The Tampa Bay Lightning have re-signed left wing Karl Stewart to a one-year, two-way contract, Executive Vice President & General Manager Jay Feaster announced. Stewart, acquired in a trade with Chicago on February 27, skated in seven games with the Lightning in 2006-07, recording two shots and two penalty minutes. A 5-foot-11, 180-pound native of Aurora, Ontario, Stewart, 24, appeared in 47 NHL games with Tampa Bay, Chicago and Pittsburgh last season, recording two goals, three assists and 47 penalty minutes. “This will be a very important Training Camp for Karl Stewart,” Feaster said. “This will be his first Camp under John Tortorella and this is where opportunities and jobs are won or lost. He needs to come into Camp in great shape and with a very positive attitude and do the little things that are essential within our system. If he does that he will give himself a chance to stick with the big Club. If not, he provides us with outstanding depth in Norfolk and we know he is knocking on the door of being an NHL regular." Looks like there will be no more moves before camp. Specifically when it comes to goal. There is no market for Denis, and there is no money to sign free agents. Feaster seems to think that we have a "core" group of netminders that can get it done if they have help. "In 2004, Nik won the Stanley Cup...not alone, but with a lot of help from his mates. In the end it takes a "team" to win, but you need solid goaltending." Feaster said. " We have an incredible core group of players in Tampa. We need a goalie to be steady, not spectacular. If you eliminate Game 1 this past season against Jersey, when Holmer played like a nervous Rookie, Holmer gave us every chance to win that series. We believe in the core of this team and we believe one (or two) of the goalies will emerge this season to give us a chance to win again. " Steady, not spectacular? Give us a chance? How about be able to steal a few? I do like Holmer, the kid has huge potential, but a number #1? I'm not sure about that. Time will obviously tell. But to say Kahbby was at the level of Denis and Holmer, and just had a little more help, is being ingenuous. Nik was a legitimate #1 elite goalie when we acquired him. When we got him from Phoenix, he had not won a playoff series, but then again, he was in Phoenix. If you remember, had Khabby not been spectacular, we would not have won the cup. HE won game 7, period. Steady may get you into the playoffs, hell, horribly inconsistent got us in this past season. But spectacular is needed to win the cup...see Kabby, JS Giguerre, Brodeur, Hasek. Every goalie has ups and downs in a season, Nik did, Holmer did, unfortunately Denis didn't have any "up's" last year. I expect we'll see him in camp though, and probably backing up Holmer this coming season mainly due to his high salary. It's hard to imagine a $2.8 million goalie playing in the AHL. He'll probably be given a game here and there to try and build his stock up a bit, and then get dealt before the trade deadline to someone needing help in net. Looks like that's about it for free agent acquisitions. To fill the last defensive spot on the roster, the Bolts are going to open it up to competition between guys they already have under contract. Perhaps foreshadowing what is to come, the Bolts have Smaby listed as one of the teams 6 defensemen on the their website. Dan Jancevski, Bryce Lampman, Jay Leach, David Schneider, and Vladmir Mihalik will also be competing for the job. I didn't think the Lightning would do anything else with regard to signing another defenseman. They are already at $41.8 million, and still have Ryan Craig to get under contract. Signing him could eat up another $1-1.5 in cap space. That's all the Lightning ownership has allotted Feaster to spend. So barring any unforeseen trades, the guys the Bolts have signed, are the guys they are going into camp with. "We will let our two-way guys battle it out with our kids," Jay Feaster told the Times. "If we don't find an answer, we believe there will be plenty of veterans still out there as unrestricteds, and there will be waiver opportunities as well." Surprising to most has been the Bolts inactivity to acquire a new #1 goalie. Denis is saying that he is working hard and ready to make amends, blah blah blah. The same rhetoric that he was spitting out all last season while stinking up the crease. He doesn't see the puck well, is slow with the glove, and needs to be replaced. This is one where Feaster needs to swallow his pride and get a deal done for someone new. Denis was a mistake. He and Feaster had history in Hershey, so there is a sense of loyalty there that Feaster tends to show his players. But this needs to be stopped right here right now. You cannot go into the season with the same guys you finished with last year. The majority of rumours this offseason have been about goalies, from Toskala to Bryzgalov...Cujo to Hasek. Yet nothing has proven to be true. Perhaps we will all be surprised in the weeks to come. I can only hope, for the sake of the team and the sanity of the fans. Apparently these are close to what the logo on the new Uni's will look like. Not a bad design. I'm not too keen on the text font, but watcha gonna do. It may all come together on the new jersey. After Ranger signed, one more defense spot remains open. According to the Times, the Lightning have been in talks and internal debate about bringing back former Lightning D-man Jassen Cullimore. "It's an absolutely perfect fit," agent Roland Thompson said of his free agent client. "He'd like to come back to Tampa, and we've had some discussions. If the opportunity came, it would be his first choice." "The biggest question now," Feaster said, "is whether we're going to have a veteran defenseman as a sixth guy. Or do we bring in the depth guys we've signed and our own kids and let them compete and if we still feel we need something during camp, see what the waiver wire brings or what may still be out there as far as free agency." The Lightning are close to their self-imposed cap of $44 million, about $42 million right now. With Ryan Craig still needing to be re-signed, there may not be enough money to sign Cullimore. Likely he would only be offered the league minimum of $475K. Also, the Blues are interested in his services, and they still have about $10 million to spend under the NHL cap. It would be a good fit to have him here in Tampa, but I don't see the numbers making much sense to him. Ranger on Friday signed a three-year, $2.8-million deal that pays $750,000 next season, $950,000 in 2008-09 and $1.1-million in 2009-10. Good cap numbers that should allow the Bolts to have enough room to get Craig signed and still have a little room to maneuver under the team's self imposed $44 million cap. TAMPA BAY – The Tampa Bay Lightning have re-signed defenseman Paul Ranger to a three-year contract, Executive Vice President & General Manager Jay Feaster announced. 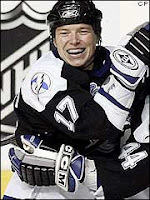 Ranger, 22, appeared in 72 games for the Lightning in 2006-07, recording four goals, 24 assists and 42 penalty minutes. He ranked third among Lightning defensemen in goals and points. Ranger, a 6-foot-2, 215-pound native of Whitby, Ontario, made his debut with the Lightning in 2005-06, recording a goal, 17 assists and 58 penalty minutes in 76 games. In five Stanley Cup Playoff games that season he recorded two goals and six points, ranking second on the team in scoring. Start making your plans now!!! OCT. 4 (Thu) NEW JERSEY 7:30 p.m.
OCT. 6 (Sat) ATLANTA 7:30 p.m.
OCT. 10 (Wed) FLORIDA 7:30 p.m.
OCT. 13 (Sat) @ Florida 7 p.m.
OCT. 18 (Thu) @ Boston 7 p.m.
OCT. 20 (Sat) ATLANTA 7:30 p.m.
OCT. 24 (Wed) @ Washington 7 p.m.
OCT. 25 (Thu) PHILADELPHIA 7:30 p.m.
OCT. 27 (Sat) BUFFALO 7:30 p.m.
OCT. 29 (Mon) @ NY Rangers 7 p.m.
OCT. 31 (Wed) @ New Jersey 7 p.m.
NOV. 1 (Thu) @ NY Islanders 7 p.m.
NOV. 3 (Sat) ATLANTA 7:30 p.m.
NOV. 5 (Mon) @ Florida 7:30 p.m.
NOV. 7 (Wed) FLORIDA 7:30 p.m.
NOV. 8 (Thu) @ Carolina 7 p.m.
NOV. 10 (Sat) @ Washington 7 p.m.
NOV. 14 (Wed) CAROLINA 7:30 p.m.
NOV. 16 (Fri) WASHINGTON 8 p.m.
NOV. 19 (Mon) @ Atlanta 7 p.m.
NOV. 21 (Wed) NY RANGERS 7:30 p.m.
NOV. 23 (Fri) @ Carolina 7 p.m.
NOV. 24 (Sat) NEW JERSEY 7:30 p.m.
NOV. 28 (Wed) @ Chicago 8:30 p.m.
NOV. 29 (Thu) @ Detroit 7:30 p.m.
Dec. 1 (Sat) BOSTON 7:30 p.m.
DEC. 4 (Tue) OTTAWA 7:30 p.m.
DEC. 6 (Thu) CAROLINA 7:30 p.m.
DEC. 8 (Sat) NY ISLANDERS 7:30 p.m.
DEC. 10 (Mon) @ Toronto 7:30 p.m.
DEC. 11 (Tue) @ Montreal 7:30 p.m.
DEC. 13 (Thu) CALGARY 7:30 p.m.
DEC. 15 (Sat) WASHINGTON 7:30 p.m.
DEC. 18 (Tue) @ Atlanta 7 p.m.
DEC. 20 (Thu) TORONTO 7:30 p.m.
DEC. 22 (Sat) CAROLINA 7:30 p.m.
DEC. 26 (Wed) @ Washington 7 p.m.
DEC. 27 (Thu) MONTREAL 7:30 p.m.
DEC. 29 (Sat) PHILADELPHIA 1 p.m.
JAN. 1 (Tue) @ Toronto 7:30 p.m.
JAN. 3 (Thu) @ Montreal 7:30 p.m.
JAN. 5 (Sat) @ Ottawa 7:30 p.m.
JAN. 8 (Tue) @ NY Rangers 7 p.m.
JAN. 10 (Thu) PITTSBURGH 7:30 p.m.
JAN. 12 (Sat) @ Florida 7 p.m.
JAN. 15 (Tue) COLORADO 7:30 p.m.
JAN. 18 (Fri) @ Pittsburgh 7:30 p.m.
JAN. 19 (Sat) @ Ottawa 7:30 p.m.
JAN. 22 (Tue) EDMONTON 7:30 p.m.
JAN. 24 (Thu) OTTAWA 7:30 p.m.
JAN. 29 (Tue) BUFFALO 7:30 p.m.
JAN. 31 (Thu) VANCOUVER 7:30 p.m.
FEB. 2 (Sat) FLORIDA 7:30 p.m.
FEB. 5 (Tue) @ St. Louis 8:30 p.m.
FEB. 7 (Thu) @ Nashville 8 p.m.
FEB. 9 (Sat) @ Atlanta 7 p.m.
FEB. 12 (Tue) MONTREAL 7:30 p.m.
FEB. 14 (Thu) @ Philadelphia 7 p.m.
FEB. 16 (Sat) WASHINGTON 7:30 p.m.
FEB. 20 (Wed) @ Buffalo 7 p.m.
FEB. 21 (Thu) @ NY Islanders 7 p.m.
FEB. 23 (Sat) BOSTON 7:30 p.m.
FEB. 27 (Wed) MINNESOTA 7:30 p.m.
FEB. 29 (Fri) TORONTO 8 p.m.
MAR. 1 (Sat) @ Carolina 7 p.m.
MAR. 4 (Tue) PITTSBURGH 7:30 p.m.
MAR. 6 (Thu) @ Philadelphia 7 p.m.
MAR. 7 (Fri) @ New Jersey 7 p.m.
MAR. 9 (Sun) @ Columbus 3 p.m.
MAR. 11 (Tue) NY ISLANDERS 7:30 p.m.
MAR. 13 (Thu) @ Boston 7 p.m.
MAR. 15 (Sat) NY RANGERS 7:30 p.m.
MAR. 19 (Wed) @ Buffalo 7 p.m.
MAR. 20 (Thu) @ Pittsburgh 7:30 p.m.
MAR. 22 (Sat) @ Florida 7 p.m.
MAR. 25 (Tue) FLORIDA 7:30 p.m.
MAR. 27 (Thu) WASHINGTON 7:30 p.m.
MAR. 29 (Sat) CAROLINA 7:30 p.m.
MAR. 31 (Mon) ATLANTA 7:30 p.m.
APRIL 2 (Wed) @ Carolina 7 p.m.
APRIL 3 (Thu) @ Washington 7 p.m.
APRIL 5 (Sat) @ Atlanta 7 p.m.
With UFA signings and trades slowing down, I thought it was time to see just where the Lightning are at, and what they still need. From a numbers standpoint, the Bolts are only $3 million under their self imposed cap of $44 million (currently at $40.8 mil). That leaves only that $3 million to sign RFA's Ryan Craig, who at present, is heading to arbitration, and Paul Ranger. Also sitting out there are Nolan Pratt and Doug Janik as UFA's. It should be no problem to fit Craig and Ranger under the "Bolt Cap", but will there be enough to possibly bring Pratt back? Would they want to? Currently, the Lightning have 4 defenseman signed; Boyle, Kuba, Lukowich and O'Brien. Once they get Ranger signed, that leaves one defensive slot open. Pratt's fate with the Lightning could rest in Ranger and Craig's hands. If those two eat up too much of the remaining cap space, which is likely, Pratt may get replaced by a cheaper Smaby, new signee Jancevski , or even Janik. So that all brings us around to what has been the focus of the most speculation this offseason, goaltending. Once all the RFA signings are done, the Bolts will most likely be up against their self imposed cap. This will leave no room to sign a UFA goalie ala Esche, Cujo, Belfore, etc. The Bolts will be left with a dilema, keep Denis on the roster along with his $2.8 million cap hit, cut him and eat $900K over the next 4 years, or try to deal him. I would love to see him traded, but who wants the guy after last season? There are plenty of stiffs (Aebescher, Burke) out there that can play the back up role just as well but for a lot less. But you never know. If I were a betting man, I would say something will get done, and Denis will be playing somewhere else next season. Bryzgalov anyone? This is beginning to sound like a broken record. The Bolts signed two more defenseman most likely bound for Norfolk. Actually re-signed one and signed another. Mike Egener re-signed with the club, and will once again probably end up with the farm club in Norfolk. It was thought when he was drafted that he was practically ready to step in to the NHL, but that hasn't happened. His game has struggled, and he has yet to make it to the big leagues. But on the bright side, Norfolk should have some decent depth on defense. The other signing was that of Dan Jancevski. He played on the Calder Cup winning Hamilton Bulldogs where he recorded 31 points including 7 goals, and was +22. Feaster seems to like the 6'3", 220 lb defenseman; "“Dan Jancevski is a gritty, strong, veteran physical defenseman and a real leader at the AHL level,” GM Jay Feaster said. “He has a very good shot from the point and he makes a strong first pass out of the zone. We like the physical presence he brings to the game and we especially value his leadership abilities. We attempted to sign him last summer and he went on to win the Calder Cup in Hamilton." It seems like adding depth in Norfolk has become a priority this off season. The Isles signed up Feds for 1 year at $2.9 million. For 32 points and a -3. Are you kidding me? A $1.3 million raise? That has to be one of the worst deals this UFA season. Enjoy his great ability to underachieve NY! I guess when nobody else wants to play there you gotta do watcha gotta do. The Tampa Bay Lightning have acquired defenceman Bryce Lampman from the New York Rangers in exchange for left wing Mitch Fritz. Lampman, 24, appeared in 60 games with the Hartford Wolfpack of the American Hockey League last season, recording six goals, 19 assists and 62 penalty minutes. He has appeared in 258 career games with Hartford, recording 19 goals, 76 points and 234 penalty minutes. He has also skated in 10 NHL games with the Rangers, recording no points and two penalty minutes. 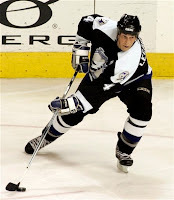 Fritz, 26, signed with the Lightning as a free agent in 2004 and appeared in 177 games for the AHL's Springfield Falcons the past three seasons, recording nine goals, 16 points and 535 penalty minutes. Esche I have heard before, and would be a good pickup at most likely a bargain price. He still has some good years in him, and would be able to be a #1 while the youngsters develop. Berard is another decent veteran defenseman. Hasn't been as good since the eye injury, but the fact that he even came back at all is amazing. Well would you look who's back. Good ole' Brad Lukowich. I'm almost speechless...well I wouldn't go that far, but it is nice to finally see a quality veteran defenseman signed. He will be a welcome addition to a blue line in need of serious help. He signed up for three years at $4.7 million. The Tampa Bay Lightning have signed unrestricted free agent Brad Lukowich to a three-year contract, Executive Vice President & General Manager Jay Feaster announced. 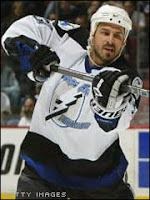 Lukowich, 30, played for the Lightning during the 2002-03 and 2003-04 seasons, helping the team to back-to-back Southeast Division titles and the 2004 Stanley Cup Championship. Lukowich, who set career highs with five goals, 19 points and a plus-29 plus/minus rating in 79 games with the Lightning in 2003-04, split the past two seasons between the New York Islanders and New Jersey Devils. In his career, the 6-foot-1, 205-pound native of Surrey, British Columbia has skated in 523 games with the Lightning, Islanders, Devils and Dallas Stars, recording 21 goals, 96 points, 333 penalty minutes and a plus-48 plus/minus rating. He has also appeared in 65 career Stanley Cup Playoff games, recording a goal, six points and a plus-9 plus/minus rating. Originally acquired by Tampa Bay in a trade from Dallas at the 2002 NHL Entry Draft, Lukowich also captured the Stanley Cup with Dallas in 1999. Don't get too excited, yet another signing of guys who will probably end up in Norfolk. The Bolts have signed Jay Leach and David Schneider to one-year, two-way contracts. Of Schneider, Feaster said, "Our chief scout in Europe, Kari Kettunen, has been watching (him) play for the past four seasons now and reporting on him to us for at least the past two. He is confident that given Schneider's mobility, vision and puck skills he will upgrade our blue line at the AHL level and provide us with much needed organizational depth." I know our minor league team needs help. But so does our NHL team, and Ouellet is far from the impact player I was hoping to see. I really hope this isn't it. UFA day 3, and I'm beginning to get worried. Lightning captain Tim Taylor said an attempt to rehab his degenerative right hip is not going well and he might have major surgery in August. Taylor said he will give his hip until then to improve, but admitted Monday, "All signs are showing that I need the surgery. It's getting worse as it goes along. I'm obviously disappointed I can't get back to where I want to be. To fill the hole left by Taylor o the 4th line, look for Blair Jones to compete with recently signed Craig MacDonald. Feaster said "This is good. This is competition. We'll see where it goes." Yeah, "we'll see" seems to be a theme this summer. Here are a couple of day 2 rumors floating around out there. The Bolts may have interest in Sabres right winger Dainius Zubrus. Last season he split time between the Caps and Sabres and put up 60 points, including 24 goals. Another rumor floating about is that the Bolts are one of 4 teams interested in former Detroit netminder....no not Hasek, Joey MacDonald. I know he went to Boston at the trade deadline, but I couldn't resist. This is a kid with a lot of upside, but that doesn't make him a #1. We have our own "kid with upside" in Ramo, so I don't see this one happening. His numbers last year: 3-7, 3.12, .894. The Tampa Bay Lightning signed free agent forwards Craig MacDonald and Mathieu Darche to one-year contracts on Monday. The 30-year-old MacDonald spent last season with the Chicago Blackhawks, scoring three goals and picking up two assists in 25 games. In 160 career regular season games with Carolina, Florida, Boston, Calgary and Chicago, MacDonald has eight goals and 14 assists. "Craig is a veteran player with significant NHL experience who will be given every opportunity to make our hockey team," said Tampa Bay executive vice president and general manager Jay Feaster. "He is a high-character guy who plays hard and competes every shift. He has very good hockey sense, is responsible defensively, is good on draws and is strong on his skates. He does all of the little things it takes to win hockey games and that makes him a good fit for us. He is also a leader at the AHL level and is exactly the kind of depth player we need to continue adding to our organization. We look forward to having him compete for a spot on our roster in camp." Darche has played in 28 games with Columbus, Nashville and San Jose over his career, scoring one goal to go along with one assist. These guys will probably be sent to Norfolk. As expected, the Lightning didn't make any plays for big name free agents, and lost one of their own. Cory Sarich said "show me the money" and Daryl Sutter and the Calgary Flames were happy to oblige. He managed to get a 5 year deal averaging $3.6 mil per year. A nice raise from the $1.9 he made last season. Not bad for a guy who never finished a season with the Bolts on the Plus side of the plus/minus stat (-6 this past season). A bit surprising was that Eric Perrin left for Atlanta. Surprising for two reasons. One: he was offered a three year deal at $1.575 from the Lightning, but instead took a two year deal at $1.5 from Atlanta. Two: he left behind the opportunity to play on the same team as his buddy Martin St. Louis. He said he felt like he was getting squeezed out on the 3rd and 4th lines. Whatever. Had he played like he was expected to last season, he would be our 2nd line winger, but he didn't, and the Bolts had to find someone else. I did like his ability to anticipate and close off the passing lanes, but his offense just wasn't up to snuff. Which brings us to the Bolts only acquisition on Sunday, that being Michel Ouellet. Ouellet played in Pittsburgh last season and only put up 19 goals and 48 points. He was an RFA heading into the offseason, but when the Pens chose not to tender him a qualifying offer, he became available on the UFA market. The guy's stats aren't all that impressive, especially since he was playing along side Sid the Kid. But stats aren't everything. He played with Brad Richards in Juniors in Rimouski in '99/'00 where he put up 89 points including 36 goals. So Feaster seems to be trying to find someone to get Richie going again. Add Jan Hlavac on the other wing, and the 2nd line has gotten a major and much needed facelift. Time will tell if this year's experiment will be a success. Heading into day two, there are no major new rumours to report. Word is that the Bolts are still interested in Anaheim's Ilya Bryzgalov. He is a guy who could and should be a number one somewhere, and since the Ducks just re-signed Guigerre, it makes since that somewhere could be here in Tampa. With a cap number of only $1.18 mil this year, he would fit in nicely to the Bolts budget conscious game plan. Perhaps an even swap for Denis? I can only hope! The Tampa Bay Lightning have signed unrestricted free agent right wing Michel Ouellet to a two-year deal, Executive Vice President & General Manager Jay Feaster announced. 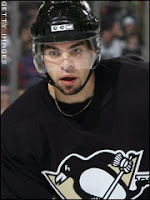 Ouellet, 25, appeared in 73 games for Pittsburgh in 2006-07, recording 19 goals, 48 points and 30 penalty minutes in only his second NHL season. The 6-foot, 201-pound native of Rimouski, Quebec ranked fourth on the Penguins with 11 power-play goals and averaged 13:19 in ice time. "Michel Ouellet is a goal scorer and has been throughout every level of his career," Feaster said. "He is extremely effective on the power play and he has a knack for burying his chances in the offensive zone. We feel his game is best suited to playing in a top-two line role and he will get that opportunity in Tampa. The fact he played junior hockey with Brad Richards in Rimouski is a real plus, as we believe there will be good chemistry between the two, and he knows how to win. For all of these reasons we feel strongly that Michel is the right fit for our hockey team." 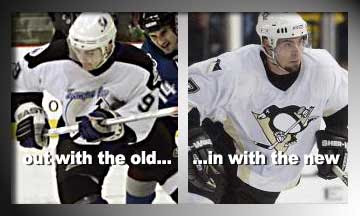 Originally drafted by the Penguins in the fourth round, 124th overall, at the 2000 NHL Entry Draft, Ouellet made his NHL debut with Pittsburgh in 2005-06 and recorded 16 goals and 32 points in 50 games. He played parts of four seasons for Wilkes-Barre/Scranton of the American Hockey League prior to joining the Penguins, recording 71 goals and 144 points in 182 games. In his first full AHL season in 2003-04, Ouellet finished first among rookies with 30 goals and fifth among first-year players with 49 points to lead his team in both categories. 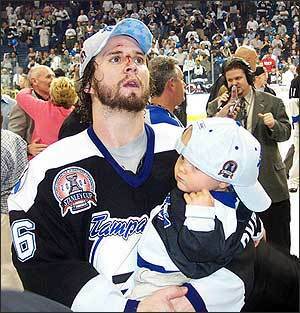 Ouellet played four seasons for his hometown Rimouski Oceanic of the Quebec Major Junior Hockey League, two of those seasons (1998-99, 1999-00) as a teammate of Lightning center Brad Richards. In 224 career games with the Oceanic, Ouellet tallied 125 goals and 299 points. As expected, Sarich is no longer a Bolt. He signed a 5 year deal with the Flames at $3.6 per year. Perrin signed with the Thrashers for $1.5.